Reggie has been unable to post recently due to being egregiously overscheduled. What with demanding work travel, an overwrought social calendar, and Darlington full of delightful weekend houseguests, I haven't had a moment's notice to sit and ponder, much less catch my breath. In the meantime I share this photo of the entry to Darlington House, festooned today with banners hung in honor of the men and women who have given their lives in service to our country, and to those living who selflessly serve it today. They are true heroes. 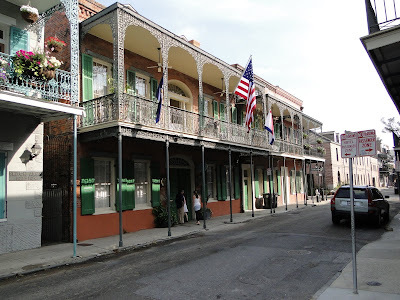 This post is about a tour that we took of the French Quarter in New Orleans, a city where we spent a most enjoyable and absorbing long weekend in mid-April. 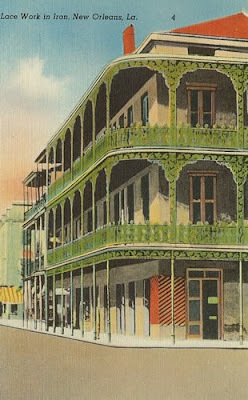 I highly encourage my readers to consider a visit to New Orleans, a hauntingly beautiful place with a vibrant authenticity, justifiable pride in its history, stunning architecture, deep-rooted culture, and delicious cuisine. 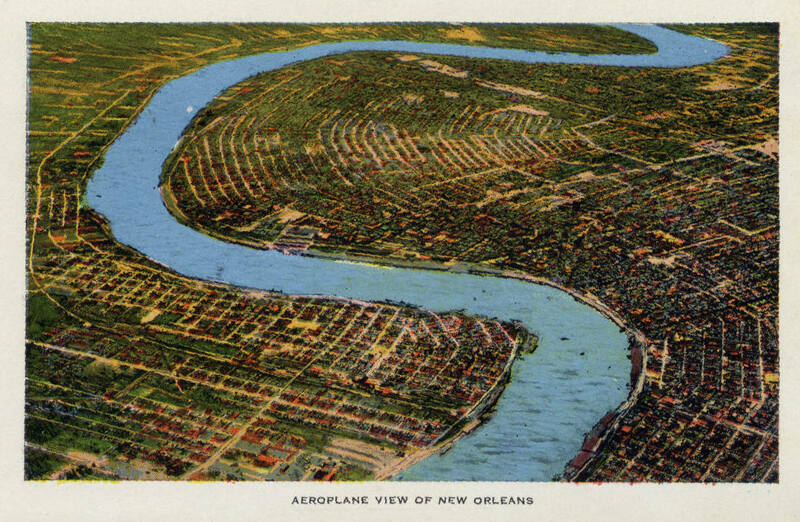 We visited New Orleans shortly before the BP oil spill began its heinous pollution of the Gulf of Mexico, the environmental and economic consequences of which are too horrific to imagine or comprehend. Our prayers go out to the citizenry and wildlife of the affected region. Shortly after arriving in New Orleans Reggie carelessly dropped his camera down a flight of stairs (! ), thus throwing a wrench into his ability to document the city's architecture and sights. 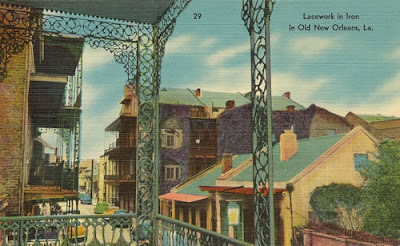 But there is a silver lining to this cloud, and I found a (more) creative alternate means of illustrating this series: vintage postcards of New Orleans dating from the first half of the 20th century. 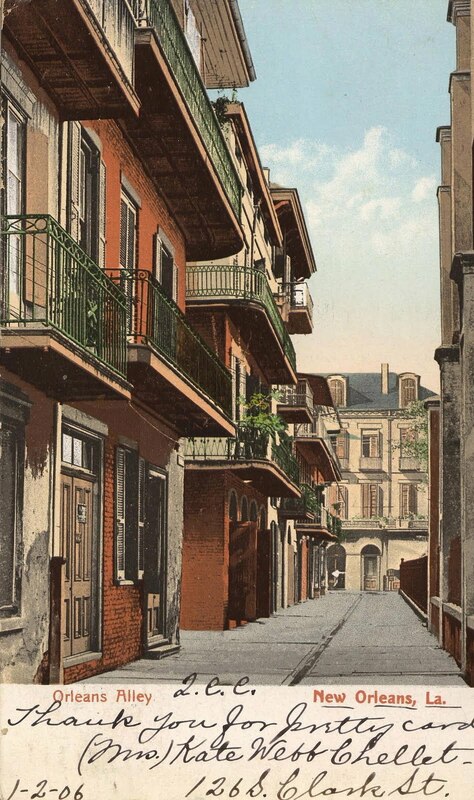 Remarkably, much of the city remains virtually unchanged from when the images on these postcards were printed. 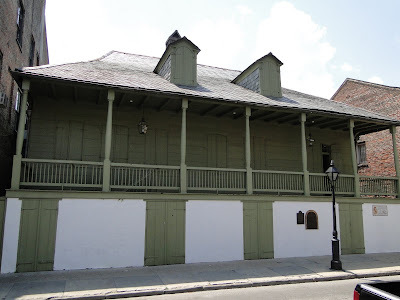 Because we only had a few days to take in New Orleans, I decided that the best way to do so would be to engage a knowledgeable guide to show us around the city and give us a crash course on its history, material culture, architecture, and neighborhoods. As I wrote in my "Pursuit of Authenticity" post on April 21st, we are very interested in learning the whys and wherefores of the places we visit, and my goal was to find someone to help us achieve that in the all-too-short time we had available to see the city. Ideally our guide would be academic and encyclopedic in his or her knowledge, articulate and thoughtful in delivery, able to share wisdom with grace and humor, and do so with the absence of pedantry. I knew this would be a tall order to fill, but I hoped that I would be successful in finding such a professor. Imagine my great good fortune that I did! A dear friend of ours in the country, who once lived in New Orleans and still visits there regularly, knew of such a person. 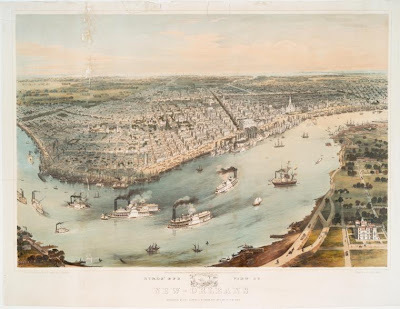 And it turned out to be a remarkable lady marvelously named Nellie Watson, with whom we were extremely fortunate to spend the better part of two days touring the city, the experience of which exceeded our wildest dreams. Not only is Nellie an amazing font of information about New Orleans and its history and architecture, but she is a lovely person, and a very pleasant and amusing companion with whom to explore the city. An architect by training and experience, Nellie has a business building architectural models for developers and construction firms and is deeply immersed in the architecture, material culture, and history of New Orleans, the city in which she was born and has spent the better part of her life. On the side, she both teaches courses on the city's architecture and leads tours of it. 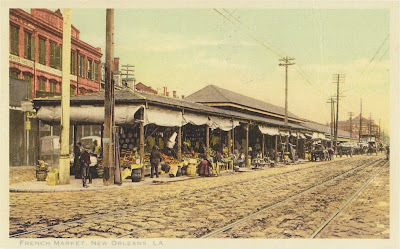 For any of my readers who are considering a trip to New Orleans or know someone who is, I highly recommend that you seek out Nellie Watson to show you the town. She is a great host for New Orleans, a city that she loves and knows intimately. I am listing her contact information at the end of this post. 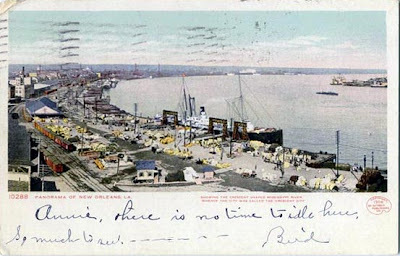 Prior to meeting up with Nellie in New Orleans I spoke with her several times on the telephone, discussing our interests and objectives for the tour. 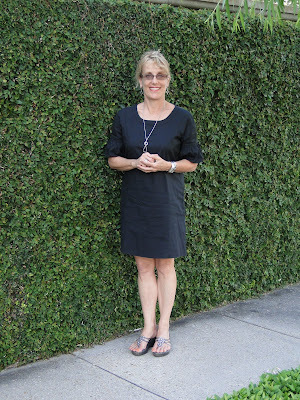 We met her in the morning of our first full day in New Orleans at our Hotel, the Soniat House, on Chartres Street in the French Quarter, where we sat and drank coffee and discussed the day's agenda. Before we headed out the door to start our tour on foot, Nellie gave us a brief history of the city, starting with its original settlement by the French, subsequent period under Spanish rule, and ultimate acquisition by the American government. She also explained the different architectural styles favored by builders under each of these successive governments. The first portion of our tour focused on the French Quarter, or Vieux Carre, the seventeen-by-six-block nucleus of the city colonized by the French in 1722. Our first stop was across the street from our hotel, where we briefly peeked through the iron fence of the Old Ursuline Convent. Built in 1752, it is the oldest building in the Mississippi valley and the only building of the original colony still standing. 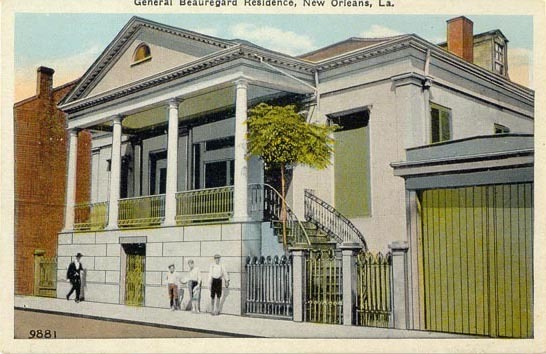 We then walked by the Beauregard-Keyes House, built in 1826, on the same block. Named after the Confederate Army General P. G. T. Beauregard (1819-1893), an early occupant, it is open to the public but was closed when we passed it. 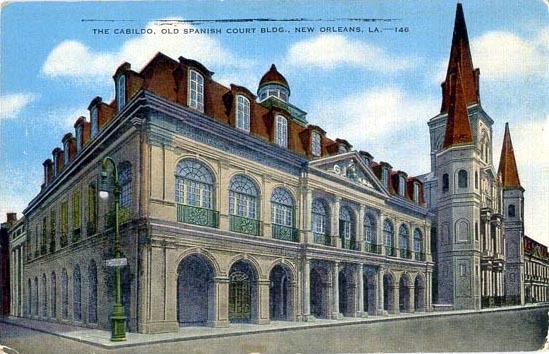 We walked by several interesting examples of the Vieux Carre's buildings, covered with amazing iron work. 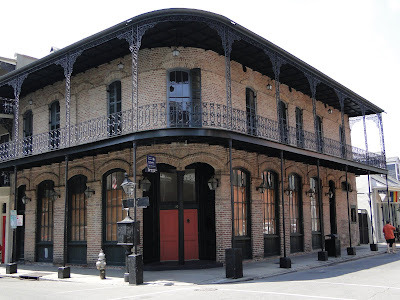 We were, frankly, bowled over by the Quarter's architecture and iron work. We learned that much of the iron one sees in New Orleans today was added after the houses were built, and that the more ornate cast iron in many cases replaced earlier wrought iron that once adorned the buildings. 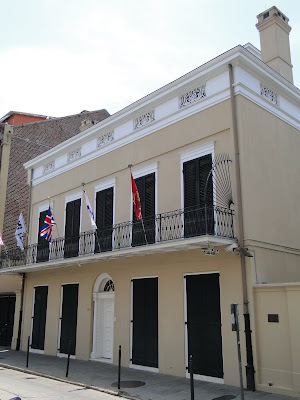 Our first stop was the Gallier House, named after James Gallier, Jr. (1829-1870), the architect who designed and built it as his own house in 1857. The Gallier House is open to the public, and we took a tour of its high-style, fully restored ante bellum interiors. If you take a tour, be sure to request Loretta Clark as your docent. She was marvelous--smart, highly knowledgeable, and charming. 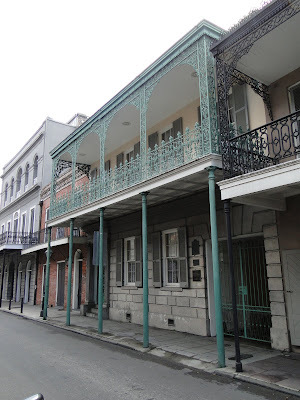 After leaving the Gallier House we continued our walking tour of the French Quarter, passing more buildings covered with incredible iron work. We then stood across from one of the city's earliest houses, known as Madame John's Legacy. 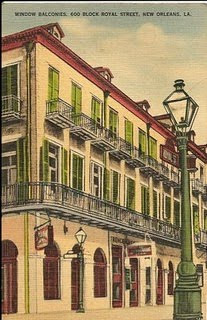 Built in 1788, after a fire destroyed the neighborhood, it was constructed in the older French West Indian colonial style, rather than the then prevailing Spanish style. 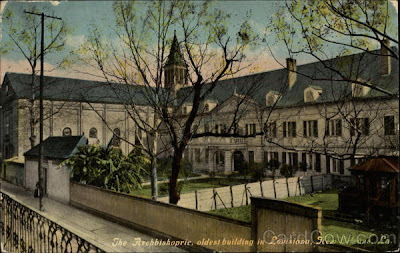 Owned by the Louisiana State Museum, it was closed that day. We then admired one of the Quarter's many houses whose facade is covered with flower boxes and hanging baskets of cascading plants. 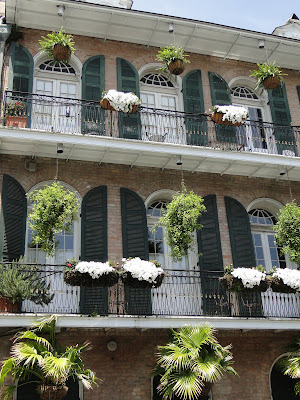 Don't be surprised when visiting the Vieux Carre on a sunny day to find yourself dripped on by water from the containers of plants found on many of the balconies. It's actually rather pleasant. We stopped and admired a recently restored Greek Revival mansion. As can be seen from this and other photographs, people use their shutters in New Orleans, just as we do at Darlington House. We then looked down Madison Street, which was known as Orleans Alley when this postcard was printed. We then strolled down Royal Street . . .
. . . where we came upon this remarkable cast-iron fence in the form of corn stalks and ears of corn. 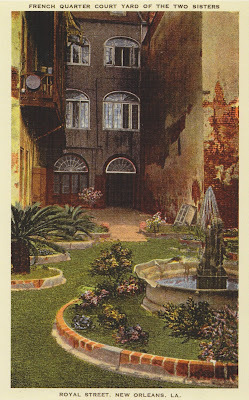 And looked into the courtyard of adjoining townhouses known as "the Two Sisters," which is now full of seating and tables for the restaurant that occupies it today. We then found our way into the Quarter's business district of shops. 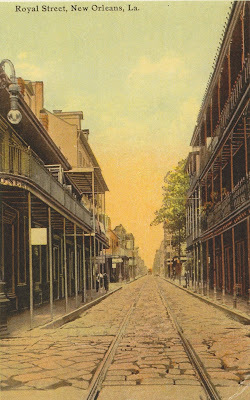 The tracks seen in the surface of the street in the postcard shown below are from the defunct streetcar line to Desire, immortalized in Tennessee Williams' play. 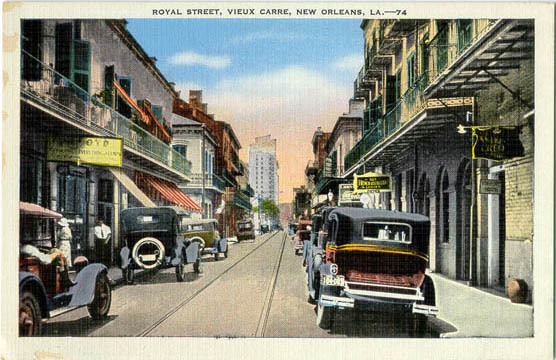 Here is another view down Royal Street, taken several decades later. 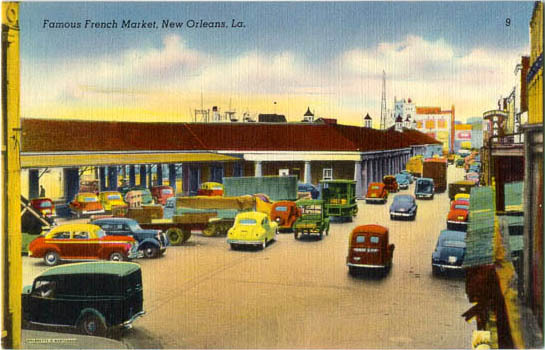 The cobblestones and streetcar tracks are today paved over with asphalt. 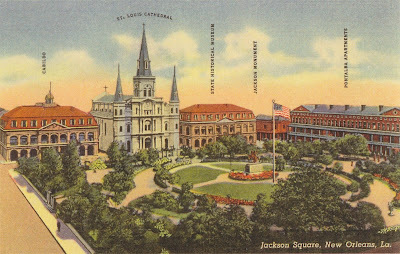 Then on to Jackson Square, the center of the Vieux Carre, and arguably one of the most famous squares in all of America. We stopped and discussed the famous facade of the much rebuilt St. Louis Cathedral. 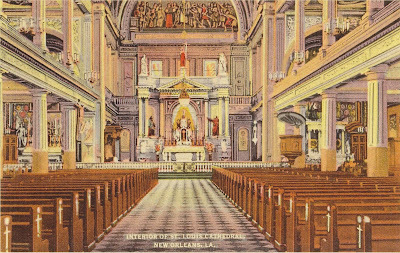 Although some portions of the cathedral remain from when the current one was constructed in 1789 (the third house of worship on the site), St. Louis Cathedral today is almost entirely the result of a massive rebuilding in 1850. We stepped inside and took in the interior of the cathedral. We didn't think it was all that, um, tasteful. 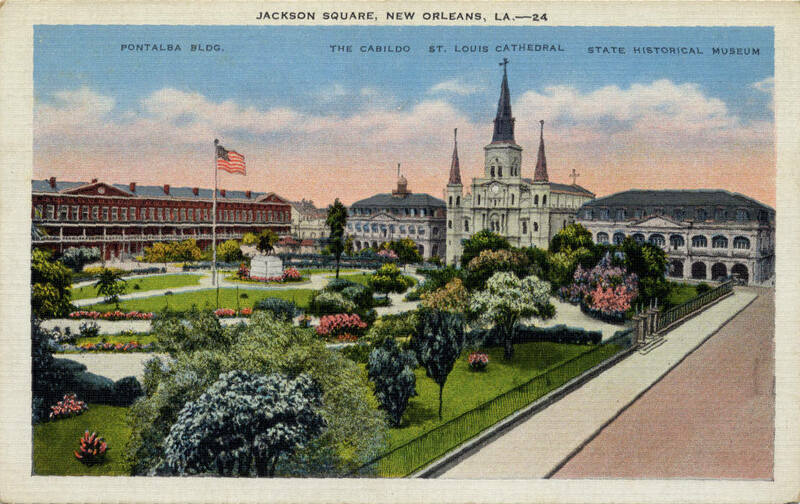 Beating a hasty retreat, we walked back outside and into Jackson Square. Also known as Place d'Armes, we learned that its original design was as an open parade ground modeled after the Place des Vosges in Paris. 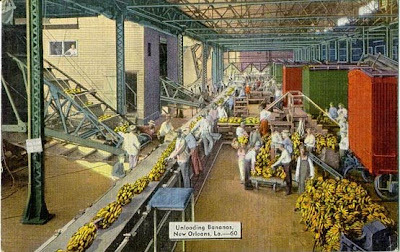 It was remade in the 1840s into the handsome park that it is today. In the middle of the square stands the Jackson Monument, a statue of General Andrew Jackson (1824-1863) before he became president. 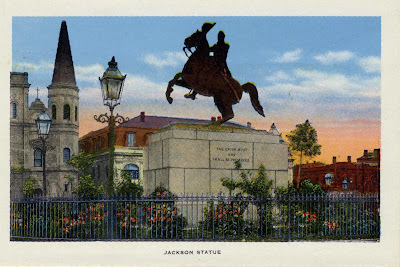 Erected in 1856, the statue commemorates Jackson's victorious leadership of American forces during the Battle of New Orleans in the final days of the War of 1812. 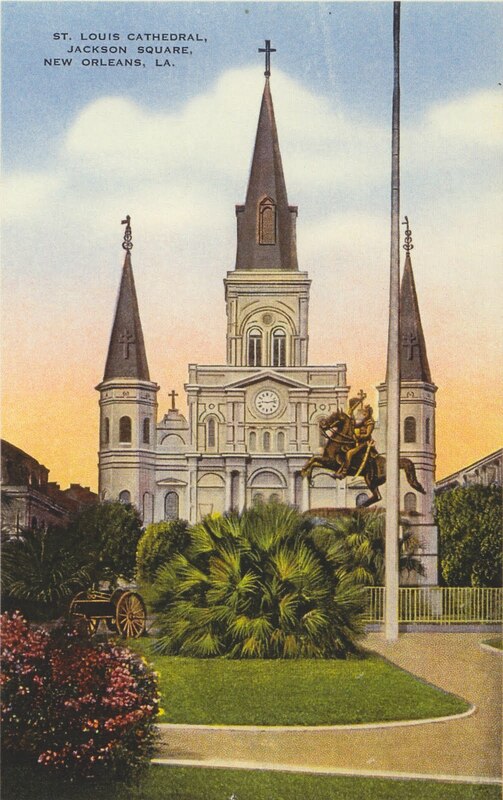 We learned that New Orleans spent much of the Civil War occupied by the Union Army, which is when "The Union Must And Shall Be Preserved" was carved into the statue's base at the orders of the occupying army's general, much to the fury of the local Confederate-sympathizing citizenry. 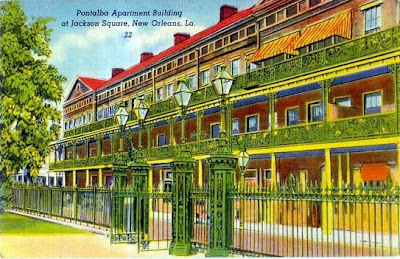 Jackson Square is book-ended on either side by two block-long, four-storey rows of handsome townhouses known as the Pontalba Apartments. Built in the 1840s by the colorful Baroness Micaela Almonester Pontalba, a local heiress who married a French Baron with near-disastrous consequences, the buildings have commercial operations on the ground floor and much-coveted apartments above, overlooking the square. Jackson Square has beautiful iron fencing and gates, which can be seen in the postcard shown above. 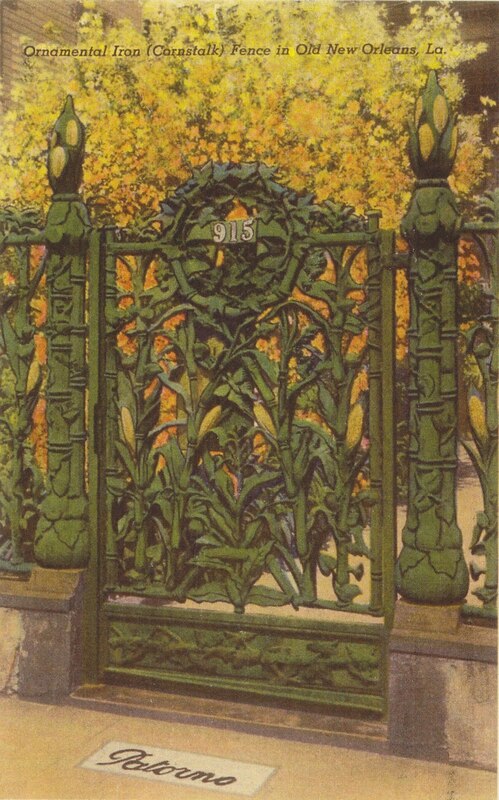 Here's a photograph that we took of the same gates. 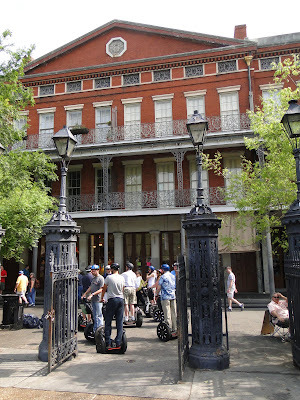 Check out the tour group wearing helmets and riding on Segways. Exiting the Square we crossed Decatur Street and headed towards the Mississippi River. 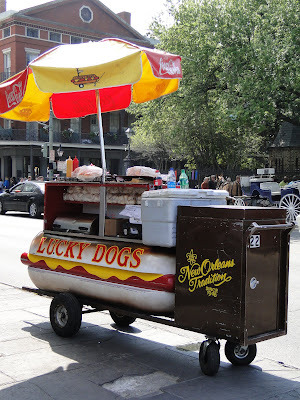 Before we got there, though, I took this photograph of a Lucky Dogs hot dog wagon. Anyone who has read A Confederacy of Dunces will recall that such a wagon figures prominently in the Pulitzer Prize-winning novel by John Kennedy O'Toole. Moving on we climbed stairs to what is known as the Moonwalk, named after a former New Orleans mayor, from where we had the perfect vantage point to take in the majesty of the great Mississippi River, which is at its widest and deepest at New Orleans. 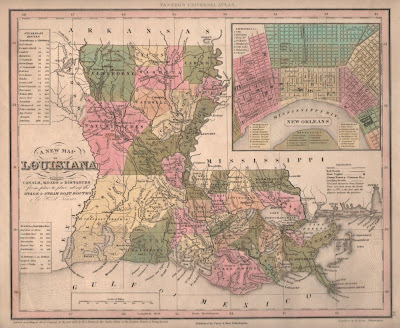 For New Orleans is, and always will be, a city defined by its relationship with the mighty Mississippi. And it is at the river's edge that one comes to appreciate why New Orleans is also known as the "Crescent City". 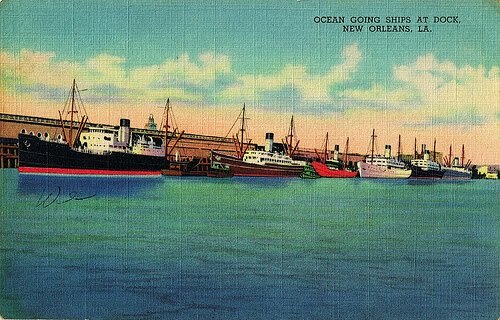 One also appreciates the vibrancy of New Orleans as this country's second largest port. 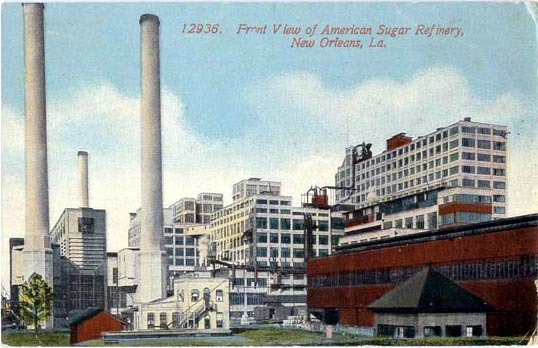 For much of its history New Orleans has been a clearing point for a substantial portion of this nation's agricultural output, including the sugar that was the foundation of many fortunes in the area. But did you know that New Orleans was also the principal entry point to this country for bananas from South America, at least until the advent of air freight? After leaving the shores of the Mississippi, we got into Nellie's car and drove by the French Market, which is now largely occupied by shops catering to tourists rather than full of the food purveyors that once inhabited it. We drove by the old U.S. Mint. 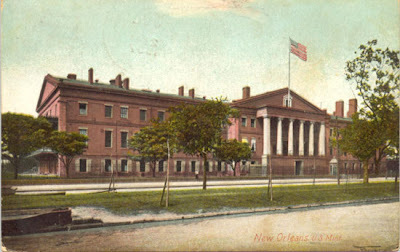 Built in 1835 and designed by the Philadelphia-based architect William Strickland, the mint was decommissioned in 1911 and is currently a branch of the Louisiana State Museum. 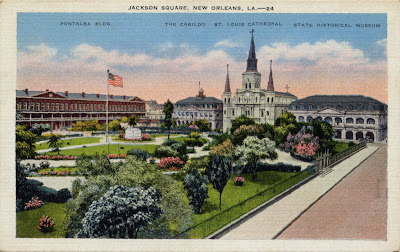 We then crossed through Jackson Square, passing the Presbytere and the Cabildo, formerly cathedral and government buildings, and now museums. 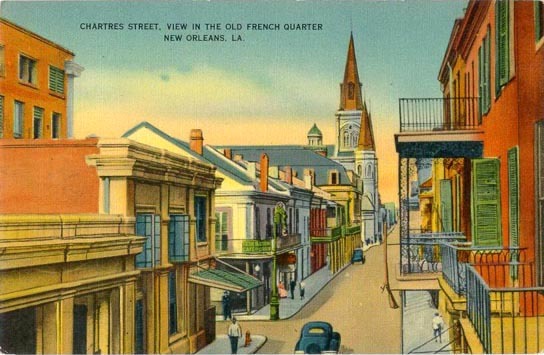 And wended our way along Chartres Street, passing several of the city's elegant antiques stores. At that point we came across the handsome Louisiana State Court of Appeals building. 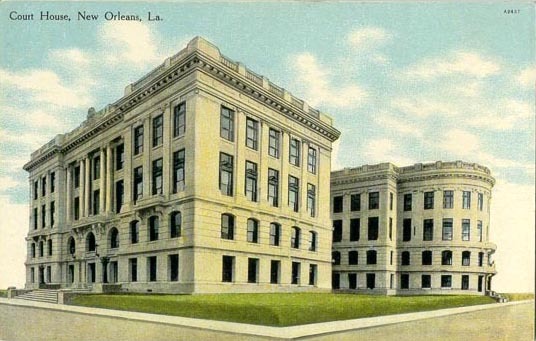 Constructed in the first decade of the 20th century in the "City Beautiful" style, it stands in stark contrast to the smaller, older building that surround it. It was the first major urban renewal project in the Quarter, and an entire block of buildings was razed to make way for it. Today the Court House is surrounded by beautiful, mature Magnolia trees. And with that, we concluded our absorbing tour of the Vieux Carre with the delightful, knowledgable, funny, and charming Nellie Watson. As I wrote in my December essay on "The Urns of Darlington: Winter," I planned on posting pictures of our urns replanted with each season's flora. Today I show the urns filled with their spring finery. Gone are the evergreens that survived the cold weather, replaced with masses of deeply inky purple Viola. To fill our urns we made a trip to Loomis Creek Nursery, a specialty retail nursery in Hudson, New York, owned and run by Andrew Beckman and Bob Hyland, plantsmen extraordinaire. We are big fans of Loomis Creek, which grows and stocks unusual specimen plants not found in a typical garden center. And that's not surprising, since Andrew is editorial director for gardening at Martha Stewart Living, and Bob is former vice president of horticulture at the Brooklyn Botanic Garden. We often find ourselves visiting Loomis Creek once or twice a weekend during planting season. We bought three or four flats of Viola Sorbet Series 'Black Delight' from Loomis Creek to fill our urns. As I wrote in my winter urn story, we plant our urns densely when we fill them with annuals, so that we have a profusion of flowers in the brief season before they are replaced with the next season's plants. Here is a photograph of one of our urns, just planted. It has not yet come into flower. Here are the urns that stand on either side of the kitchen entry to Darlington, in full flower. Next is a closeup of the blossoms. They are actually a deeper, darker purple than the photograph indicates. This next photograph is of one of the urns leading up to our entry. It is a more accurate representation of the flowers' color. We have painted all of the metal garden furnishings at Darlington, including these urns, in Farrow & Ball's "Off-Black," No. 57. I think they look particularly good in a high-gloss finish. Here is the urn that stands at the base of the bluestone walkway to our house. Boy photographed it in the late afternoon with the western sun raking through the Violas. This concludes my tour of the spring planting of our urns at Darlington. In only a few short weeks it will be time to replant them with their summer occupants . . . so please stay tuned! 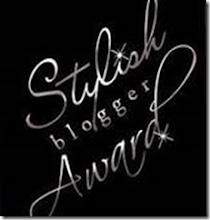 Yesterday Reggie was flattered beyond belief when Little Augury, one of the most elegant and interesting lifestyle and design blogs out there, and a daily "must read" for yours truly, bestowed upon Reggie Darling two--that's right, two--blogging awards. One, in and of itself, would be an honor; two makes me blush with the hot flush of both intense pleasure in such accolades, and an uneasy nervousness that it is all too much too soon for such as I, a relative neophyte in these environs, confusedly stumbling midway along the path of life much as Dante did years ago. The first award Little Augury gave to Reggie was a "Prolific Blogger Award," which she defines as recognizing " . . . one who is intellectually productive, keeping up an active blog with enjoyable content." The honor of such an award requires the recipient to "pass it forward to seven other deserving bloggers," referred to as "the Magnificent Seven." 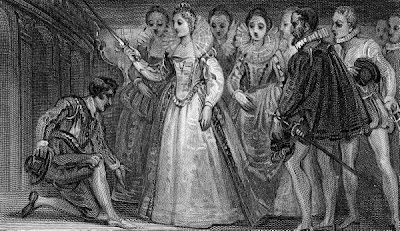 These are the first blogs that I check into daily, hoping for new postings to luxuriate in reading, examining, and pondering, and I commend them to you to do the same. Should you, Dear Reader, track back to LA's posted awards ceremony, you should not be surprised to find some repetition of certain names that also appear on her list. For we are, I posit, fellow travelers, LA and I. Therefore, those of you identified above that are doing double duty may rest on your laurels and sit back and enjoy the adulation without the need of passing on the torch--again. But those of you who are anointed for the first time by yours truly, and you know who you are, are, I am afraid, expected to feed the Prolific Blogger Award beast and pass on the torch to your own Magnificent Seven. With recognition comes responsibility. You may ask, but aren't there other names that Reggie reads daily? Yes there are, many in fact. And there are several that Reggie would dearly love to include in the above list, should such magnificence be extended to, say, twelve names. Those would include Architect Design, Lindaraxa's Garden, Privilege, The House of Beauty and Culture, and The Neo Lifestyle. There are also several other names that would appear on Reggie's Magnificent Seven list, but who don't because the frequency of their delicious posting is somewhat sporadic, as it is clear their authors have better things to do with their time than post with rabid frequency. The two that come most immediately to mind in that category are Emily Evans Eerdmans and Frognall Dibdin's Shelves. And I would be remiss were I not to mention An Aesthete's Lament, the recently departed and greatly missed Zeus of the Lifestyle Bloggers and in front of whom Reggie bows in subservient and glorified worship, yelping admiration. Were Aesthete still posting today he would certainly lead Reggie's list of Magnificent Seven, ahead of all others. The second award that Little Augury bestowed upon me as one of her Magnificent Seven, which really is a fallout of the first, I suppose, was a "Beautiful Blogger" award for, I suspect, the pretty images that I, from time to time, post on Reggie Darling. And for that I must acknowledge the contributions of my dear Boy Fenwick, my partner on Reggie Darling and in life. Boy takes most of the photographs that appear on RD, and is a frequent inspiration for the blog's content. He also edits Reggie's scribbles to ensure that they are not embarrassingly ungrammatical. This is, indeed, a collaborative effort. I know all the lyrics to Rodgers and Hammerstein's "I Enjoy Being A Girl". So, there you have seven heretofore unknown facts about Reggie Darling. Are you surprised? I rather doubt it . . . In closing, I would like to thank my dearest Little Augury for these lovely awards. I am indeed flattered. And to my own Magnificent Seven I now say: get to work! Several weeks ago I decided to surprise Boy one evening by secretly inviting two friends of ours, Lowell and Courtney, to join us at a cooking class held one evening by the inestimable Gail Monaghan here in New York. Gail, a cookbook author and all around genius in the kitchen, teaches cooking classes out of her art-filled loft in lower Manhattan, and also runs luxurious culinary tours of exotic locales. I plan on featuring Gail and one of her cooking classes in a future posting. I invited Lowell and Courtney to join us as a surprise treat for Boy, since we both enjoy their company, and I thought that they would appreciate meeting Gail and joining us at one of her classes. We had a lovely time with Lowell and Courtney that evening, and they hit it off with Gail as well, with whom they share a love of cooking and contemporary art. 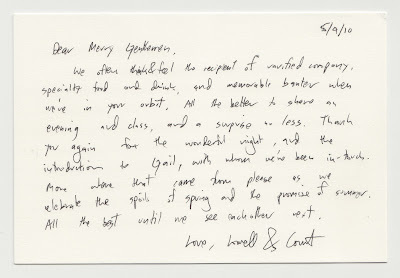 Shortly after attending the class we received a thank-you note written by Lowell that stands out, in my mind, as exemplifying the craft of such missives, and which I am sharing with you, Gentle Reader, as an example of that which to aspire to when writing such communiqués. So what is so noteworthy (pun intended) of this note? All in all, it is one of the best thank-you notes that I have received in a long time. Gentle Reader, I commend it to you as an example to aspire to when writing such notes when you have been the happy recipient of a host's hospitality. Following its format will ensure that its reader will remember your acknowledgement and good manners with pleasure, and will favorably incline them to invite you, again, to future festivities. It is a gold-star example of such missives and the successful realization of rule number one of Reggie's Rules of Social Reciprocity. This is not the first time that Lowell and Courtney have been referred to on Reggie Darling; you can read more about them in a post I did here.